Almost every manufacturer has them in their series. 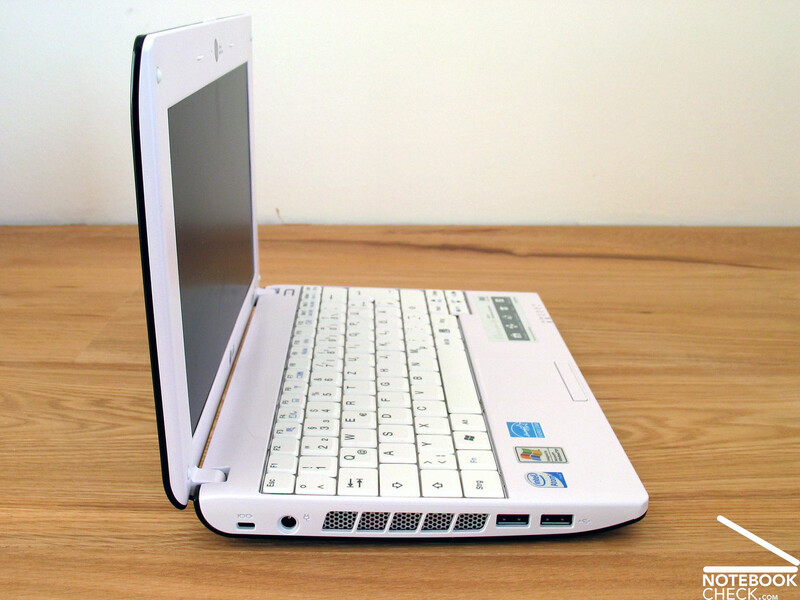 10 inch netbooks at an absolutely attractive starting price. 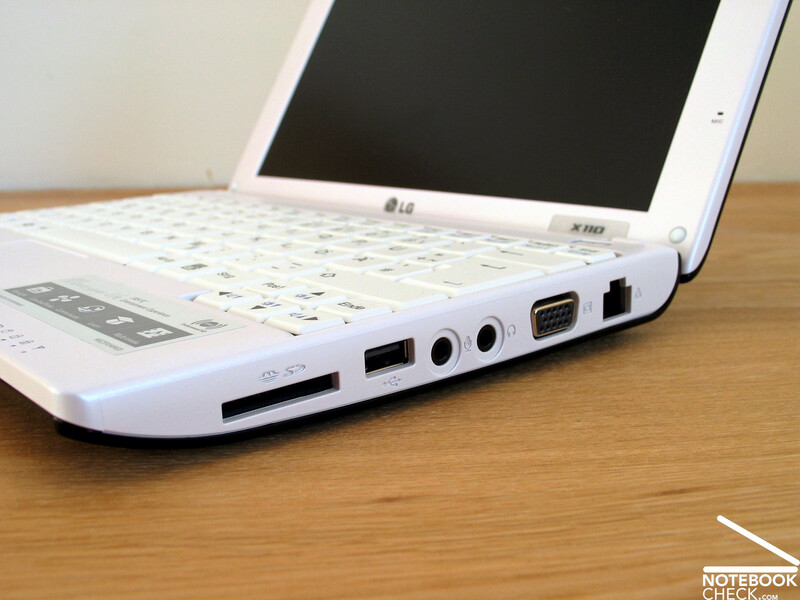 LG sends the X110 into the race, a chic mini-notebook with the usual hardware equipment. In the following editorial, you can discover where its strengths - but also its weak points are. 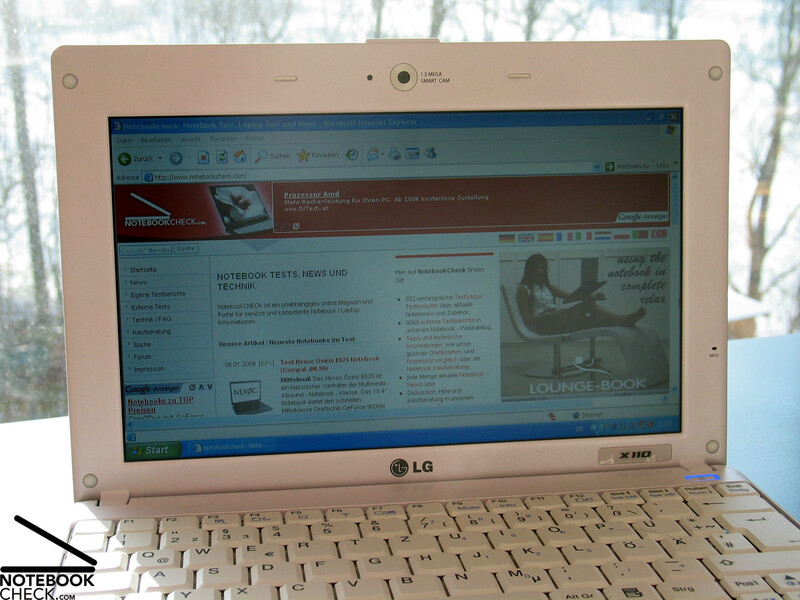 The X110 is currently the only netbook offered from LG. The manufacturer offers a total of four variations: The X110-L A7SAG or the X110-L A7SBG which define the start variants and only differ in their coloring (black-white, solely white). Both designs are also available with an integrated, wireless broadband under the product number: X110-L A7HAG or X110-L A7HBG. In regards to the measurements of all 10" netbooks, you might think that all cases come from one and the same factory (who knows…? 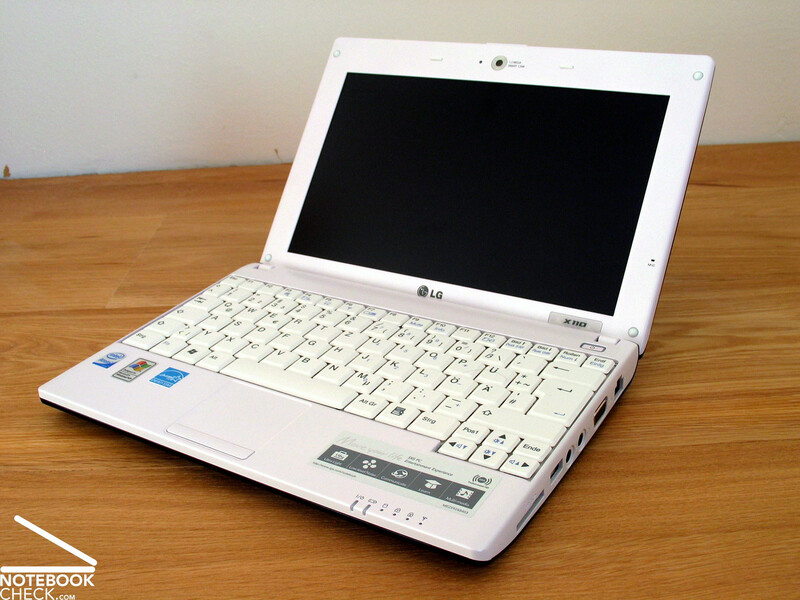 ), because the LG X110 also corresponds with a case breadth of 261 millimeters to its netbook colleagues, Eee PC 1000H from Asus or even the Samsung NC10 being almost cut of the same cloth. LG sets on design of the above mentioned variations. 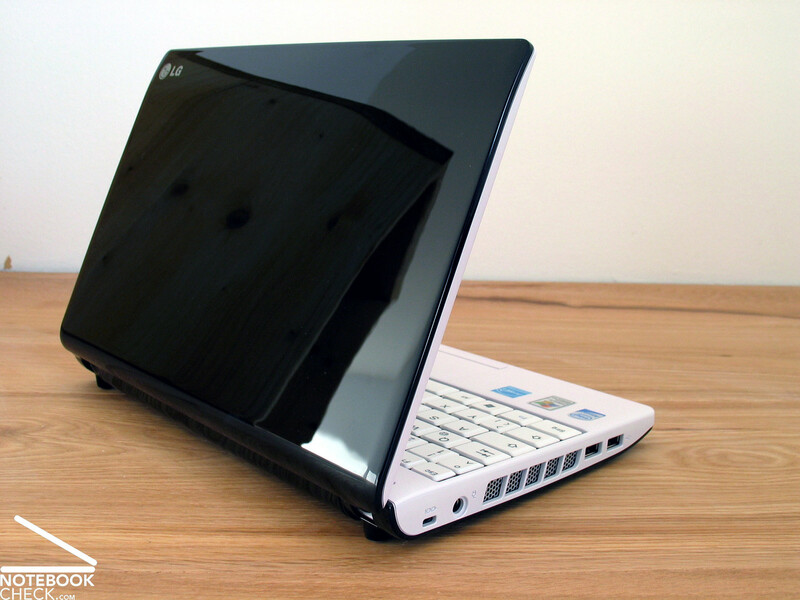 On the one hand, a model with a black and white color combination is offered, reminding somewhat of a sandwich and on the other, there's the design variation clad completely in white, for the innocent of the netbook customers. We were allowed to take a closer look at the sandwich alternative in the test. The display lid is covered with a black high gloss finish on its outside. But that's not enough. 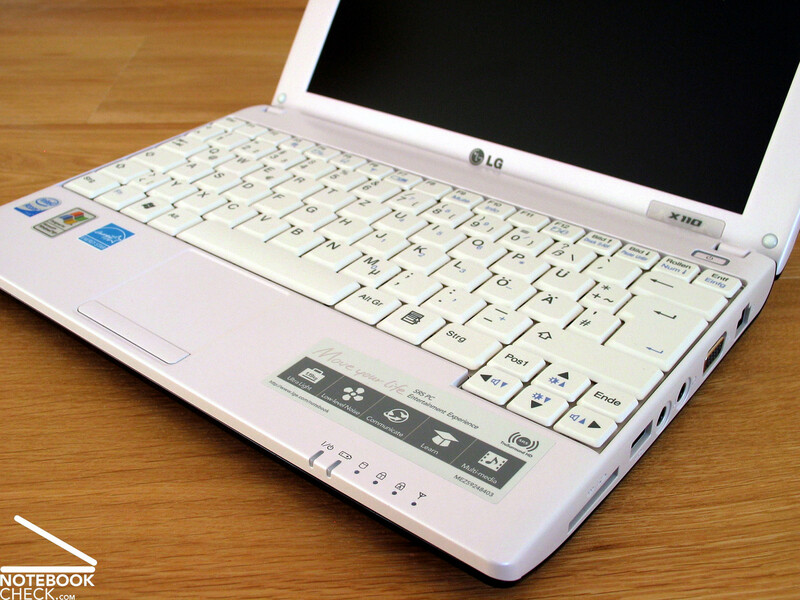 LG tops that, because as one of the first net/notebooks in our hands the manufacturer actually dared to make the bottom side of the device in a high gloss optic, too. Already after taking of the protecting cover for the test, countless fingerprints were collected fast on the outer sides of the device. That's the first point of critique for the X110 in this regard: Where, please, is the obligatory microfiber cloth in the range of delivery, with which you can at least try to strife this problem? In any case, the stability of the base unit is o.k. LG most likely falls back onto a magnesium alloy, too. The case puts away applied pressure very sufficiently with exception of the bottom side in the area of the louver. This applies to the display, as well, which offers an even as good protection for the sensitive display. We weren't particularly happy with the display hinges. These didn't only appear especially delicate; they couldn't prevent an observable luffing of the display when in motion, either. Besides that, the maximum opening angle is limited to 133°, which constricted us considerably in the one or other situation during the test. The LG X110 also does without a safety catch. But apparently a magnet provides for a better hold in a closed condition. 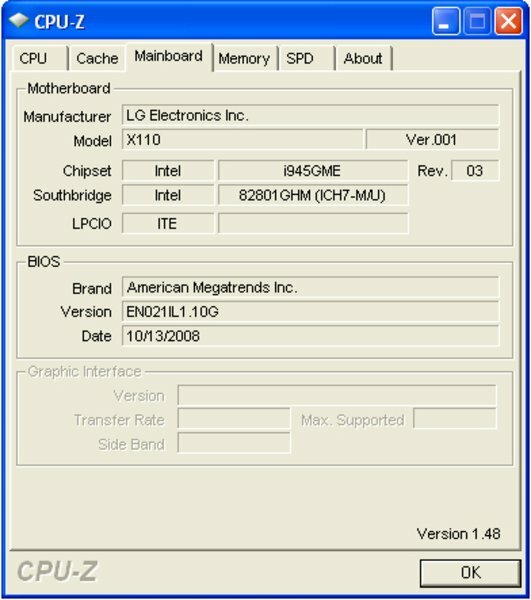 There's no surprise in the offered connections of the X110. On the device are found: three USB 2.0 ports, 3.5mm sockets for a headphone and a microphone, a VGA connection as well as a RJ45 port for wired network. A 4in1 cardreader is also offered. Under certain circumstances, the placement of the single ports may lead to problems at mass occupancy. Both USB ports are positioned fairly far on the front side edge and even the right USB is found in the first third of the side edge. A Realtek RtL8102E network interface card (10/100Mbps) provides for a respective data transfer over cable. Alternatively, this can also take place over the built in 802.11 b/g wireless LAN module. This also applies for Bluetooth. Only the higher value variant equipped with a wireless broadband internet includes Bluetooth 2.0+EDR in its bundle. With a street price of about 430.00 euros, you have to put about 100.00 euros on top of the starter variation. Video conferences are made possible with an UMTS module and a webcam (1.3 megapixels) built in to every variation. The integrated cam had big problems with moving pictures, even at a minimal resolution of 160x120 pixels. 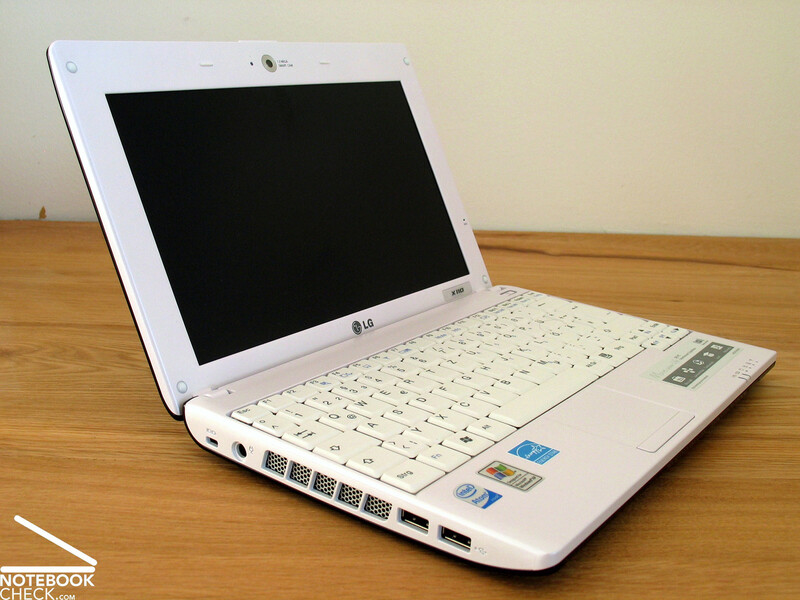 Regarding the guarantee, LG also offers a 24 month warranty with a "pick up and return service" on the 1200 grams heavy, or rather light, mini-notebook. 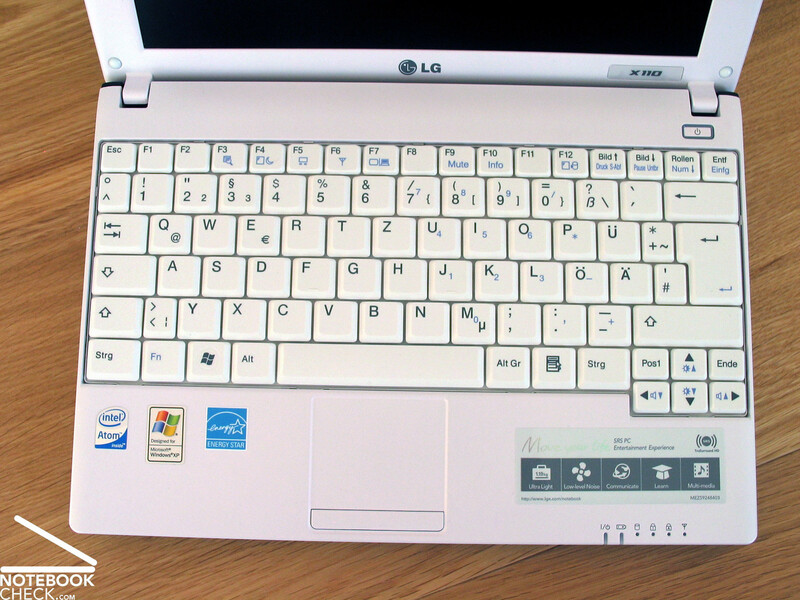 All current 10 inch netbooks offer a very similar keyboard with only small differences. This is already primarily defined through the size of the device. 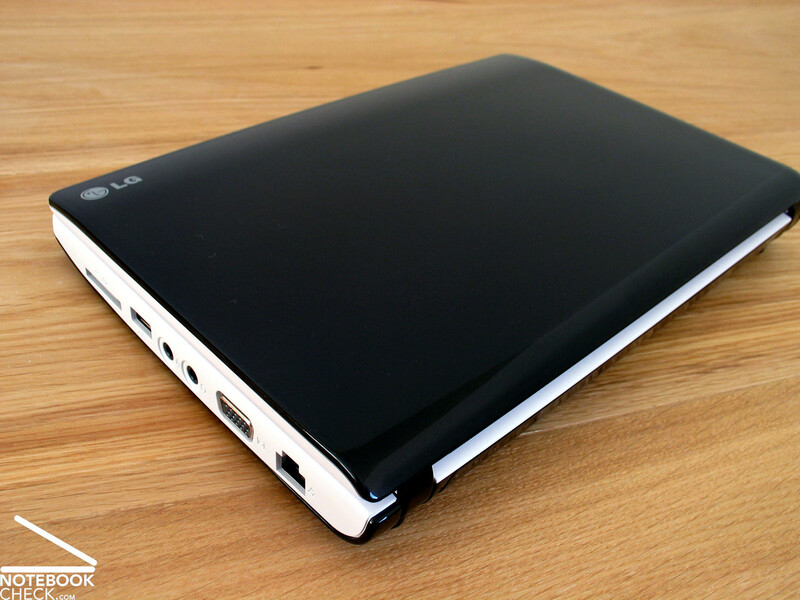 With a case width of 261 millimeters, the X110 from LG offers quite the same space as the netbooks giants Asus Eee 1000H or the Samsung NC10. The single figure-keys measure 1.7 x 1.6 centimeters and correspond with that to the class standards, too. Therewith, the input fields were treated to a sufficient and very useable size, with exception of the ^, + and # keys and the cursor keys. The offered keyboard could also convince in the practical test. Not just the measurements of the single keys, but the layout and especially the typing feeling turned out to our satisfaction. 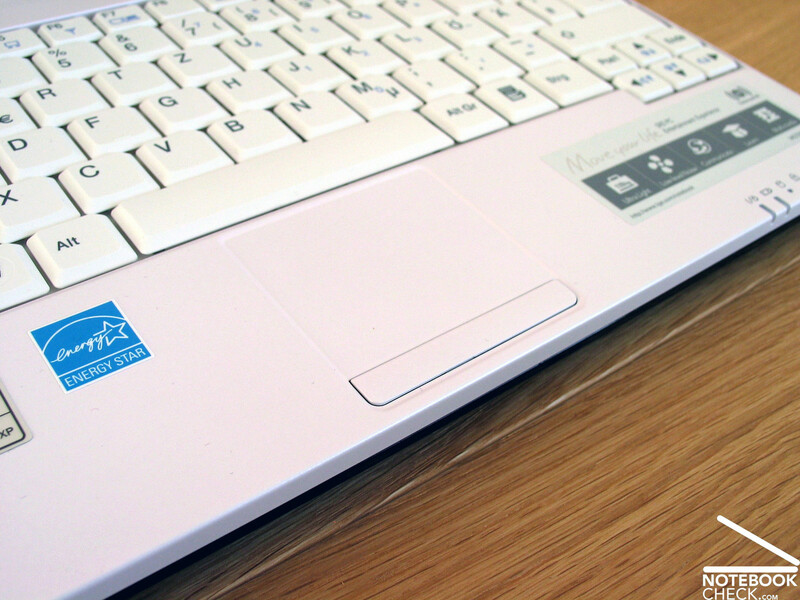 It was possible to use the netbook even for touch typing without any further problems. 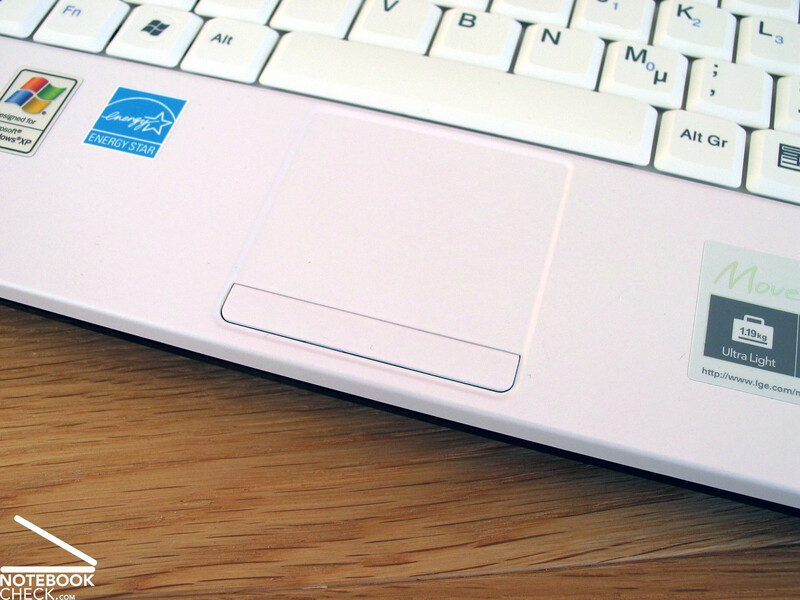 The touchpad surprisingly showed an almost squarish layout, very untypical for a netbook of this size. With an area of 5 x 4 centimeters the pad offers enough room to navigate quite nicely. Both touchpad keys turned out to be not quite as convincing, though. For one thing, the end to end key bar had a very large dead zone in its center and for another the keys could only be pressed with a large amount of pressure. Therefore, it is advisable to use both hands to work the pad. 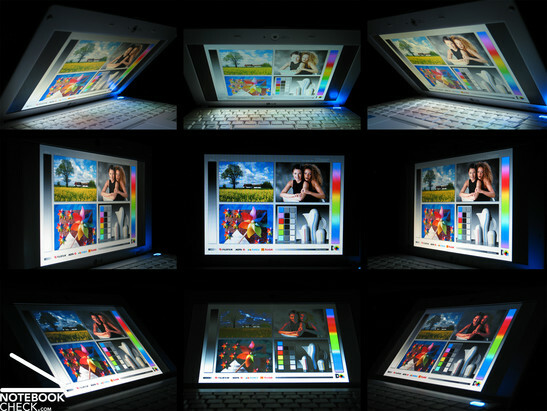 LG sets on a 10" WSVGA LED screen, which corresponds to the current standards of this device category, with a resolution of 1024x600 pixels for a display. As for all other comparable netbooks, we have to refer to the need of an increased scrolling during surfing, as well as during the use of various other programs for the X110. 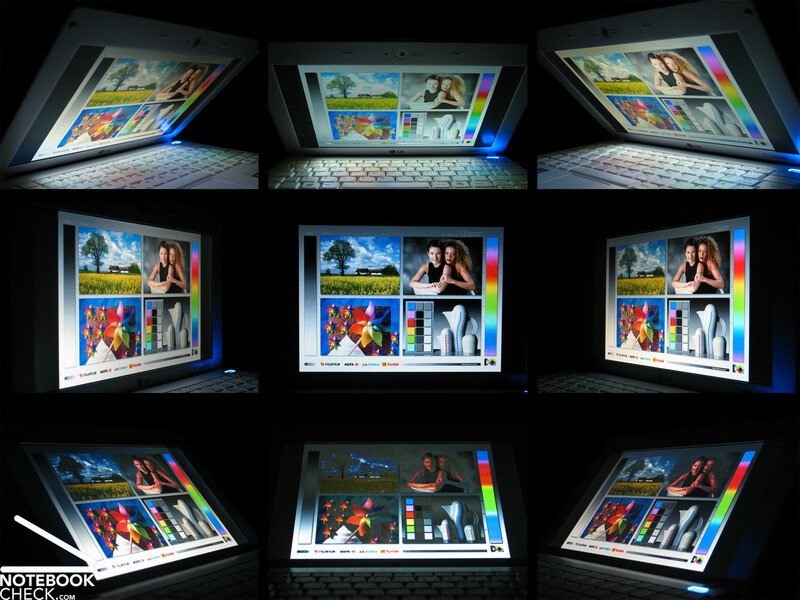 In our test the screen delivered a very good result of 255cd/m2 in the lower middle area as for the maximal display brightness. Unfortunately, the display brightness fell considerably in the upper corners (down to 198 cd/m2), resulting in an only under average illumination of 74% of the display. Regarding the maximum possible contrast, the display reached an equally good result. The minimum measured brightness of 0.36 cd/m2 (black value), resulting of interaction with the maximal brightness, reached a very good contrast value of 663:1. Due to the good display brightness as well as the matt display surface, the LG X110 is absolutely suitable for outdoor use, even surroundings with adversely bright light conditions. 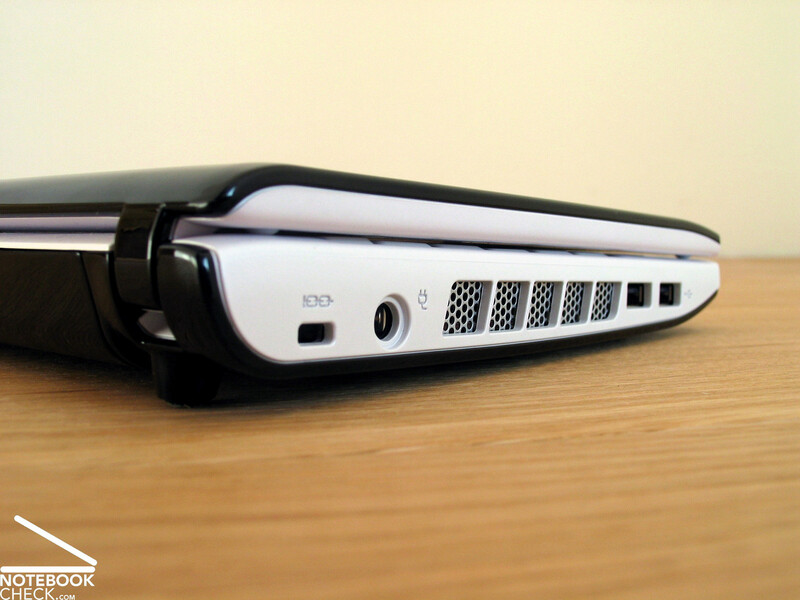 The given stable viewing angles of the X110 generally correlate to that of other netbooks. In the horizontal area satisfactory viewing angles can be noted, whereas image distortions have to be counted with much faster in the vertical viewing areas. 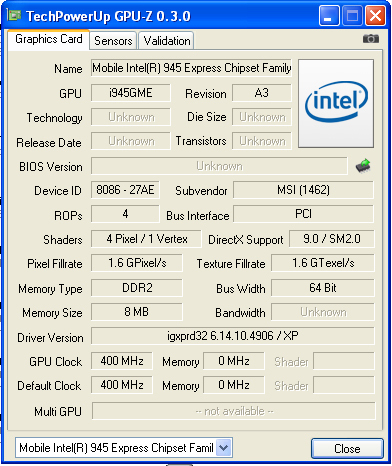 You could almost think that an Intel Atom CPU with an Intel GMA 950 graphic chip is the inevitable basis for a netbook. 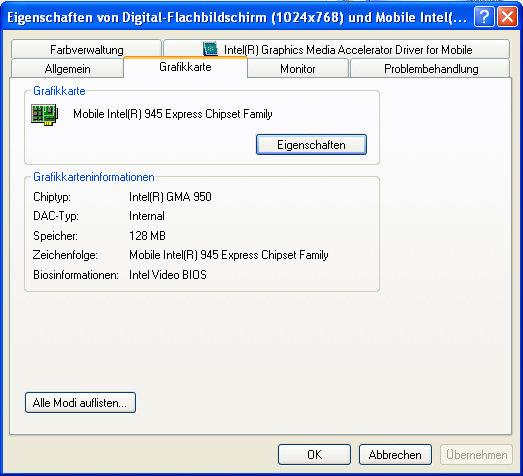 Even if this is not so and other technologies would be applicable, Intel evidently offers at present the most attractive value for money ratio with this package. 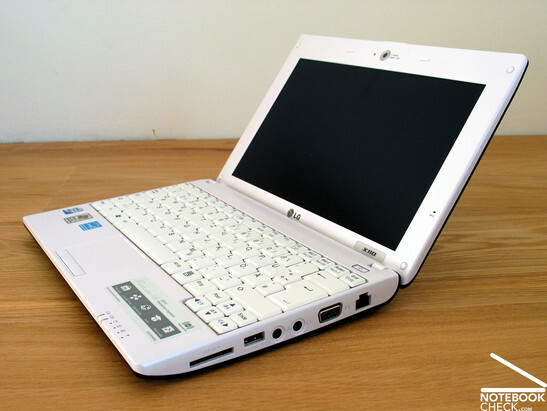 The performance of the netbook is therefore construed for standard office applications, i.e. writing texts, simple spreadsheets, picture galleries, e-mail traffic and internet. These tasks are completed from the Intel package absolutely satisfactorily. The system only runs out of air fast at performance intense computing tasks and graphic applications. Netbooks aren't designed for that, anyway. 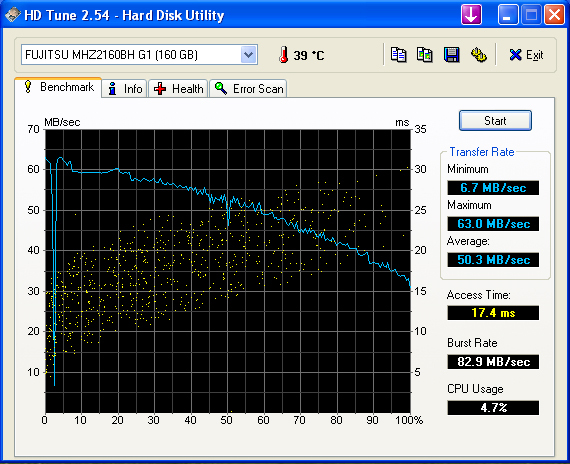 Regarding the hard drive, a common hard disk from Fujitsu (MHZ2160BH) came to use in our test model of the LG X110. 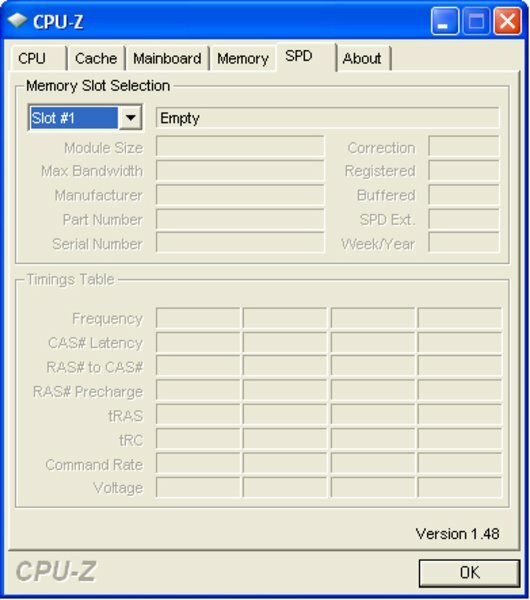 This is the same memory module as used in our test of the netbook competitor from Samsung, the NC10. The disk with a rotation velocity of 5400 rpm and a gross capacity of 160 gigabytes showed very good results in the HDTune benchmark test, regarding the transfer rates and access times. 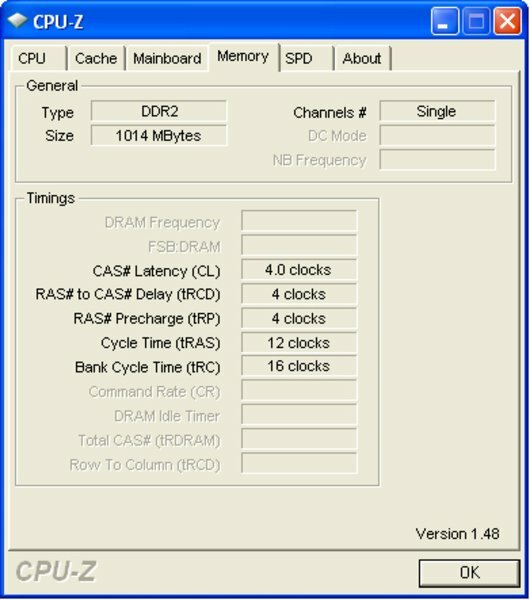 For the main memory, a 1024MB DDR2 (533 MHz) RAM was used ex-factory. 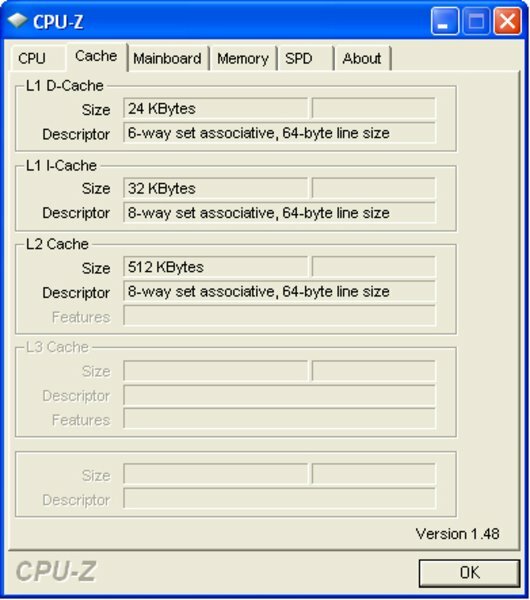 The application of maximal 2 GB are also only possible here, which can have advantages in certain memory-heavy applications, for instance image editing or simply using more programs at once (multitasking). 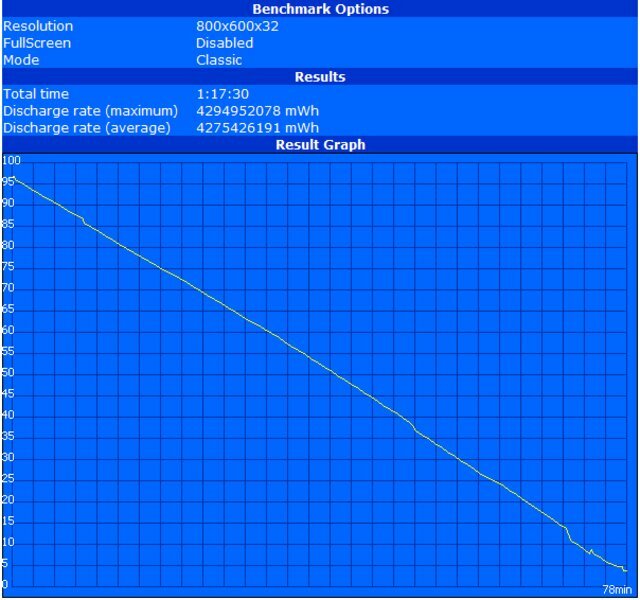 When using the netbook in its energy savings profile (minimum energy use), the system fan stays mostly deactivated even in applications with a low load, i.e. surfing in the internet or text writing. The netbook remains practically silent except for quiet running noises from the hard disk. Every now and then we could observe a short start up of the fan, though. The fan turned on in the adapted profile of portable/laptop or even at a slight higher load and runs practically constant at a very well audible level of 34.4 dB(A). 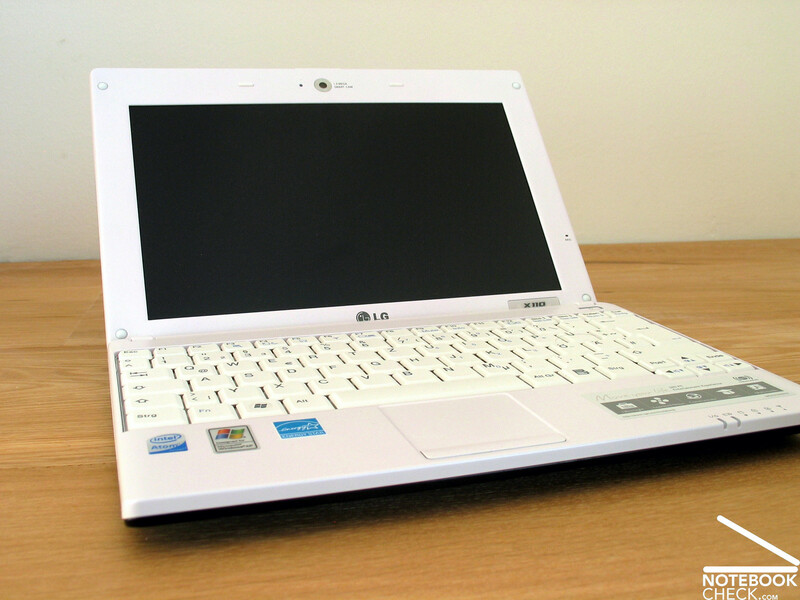 We could elicit a maximum of 40.3 dB(A) out of the LG X110 under load, whereas the mini-notebook may very well be described as loud. This should be barely ever achieved in the classic application areas of the netbook, though. Interesting was that we were able to measure the "maximum" heating on the upper side of the device. This was 32.2°C in the middle area of the keyboard. The bottom side of the device stayed with a maximum of 31.7°C slightly beneath this value. Generally, mobile use on the lap is possible, with that. (-) The average temperature of the palmrest area of similar devices was 29.3 °C / 84.7 F (-2.3 °C / -4.2 F). The sound of the integrated speakers could almost be called a disgrace. 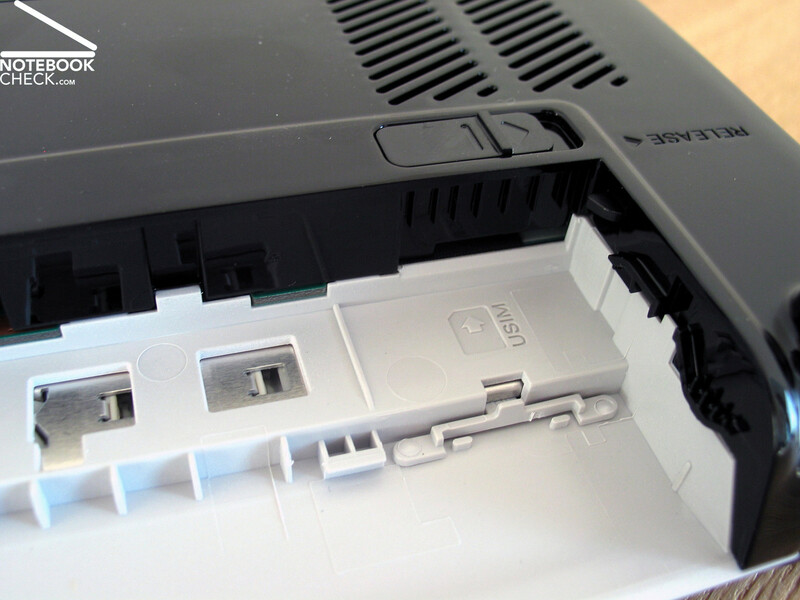 These are placed on the bottom side front area of the netbook and throw their extremely thin and tinny sounding sound waves against the set-up area of the netbook. Generally, it's safe to assume that you can forget these speakers for music playing. Its bandwidth is at the most enough to play Window system sounds, and even here you shouldn't have the volume turned up to high. In the end, there are only the offered audio ports to make music playing acceptable. These delivered an adequate sound in the test and made even the LG X110 to a mobile audio player. 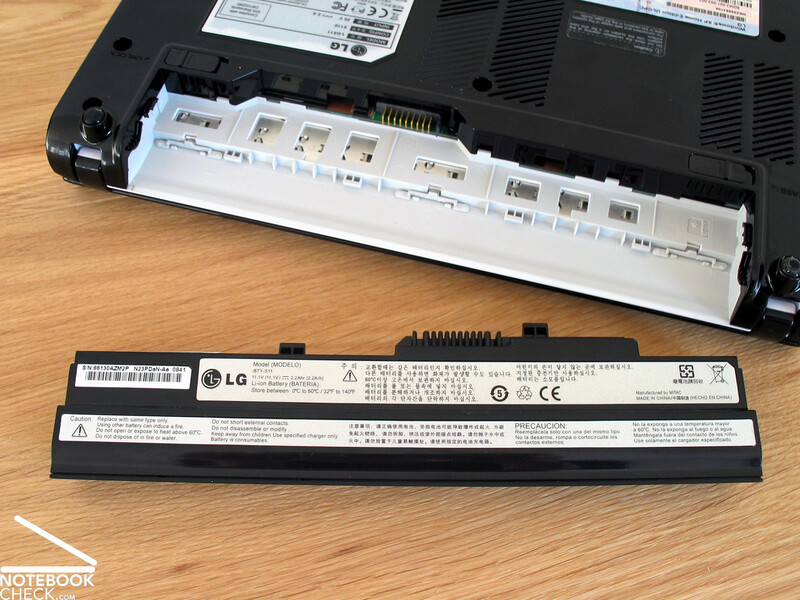 LG offers, according to its spec sheet, two different battery versions for the X110. A 3-cell battery with a capacity of 24.4 Wh or a bigger 6-cell battery with a respective larger storage capacity. Our test sample was fitted with a 3-cell battery, which bode ill in comparison to the high performance batteries of the competitors. 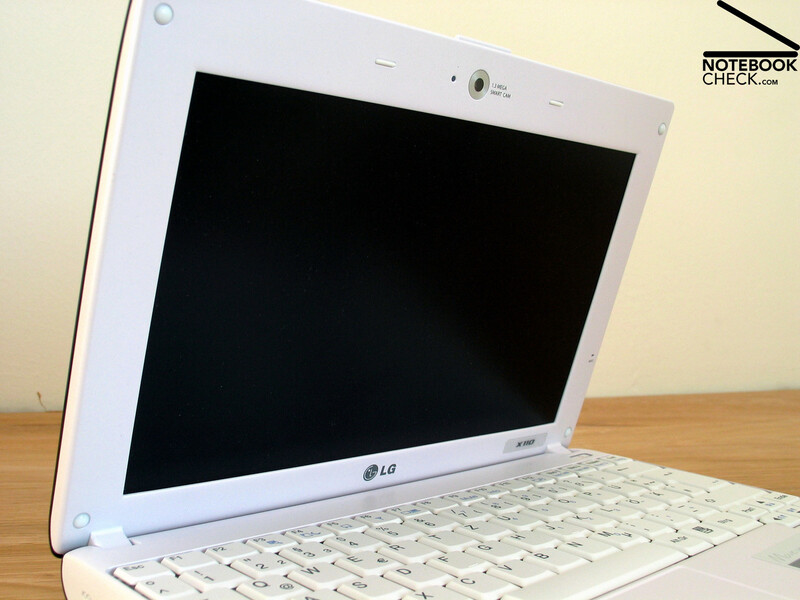 In the BatteryEater test, representative for the maximum possible battery runtime of the netbook, with maximum energy savings options (min. display brightness, energy savings mode, WLAN off) our test sample reached a runtime of merely 148 minutes. Under load (max. display brightness, high performance profile, WLAN on) it was even less. It already came to an end after 78 minutes. It didn't really get better in the practical WLAN test. With maximum brightness in the profile portable/laptop the X110 reached a runtime of 125 minutes, equal to somewhat more than 2 hours. Not much, if you consider that a netbook is primarily thought for mobile use. Various netbook competitors offer at least double as much durability in this exercise, admittedly with a respective larger battery capacity. 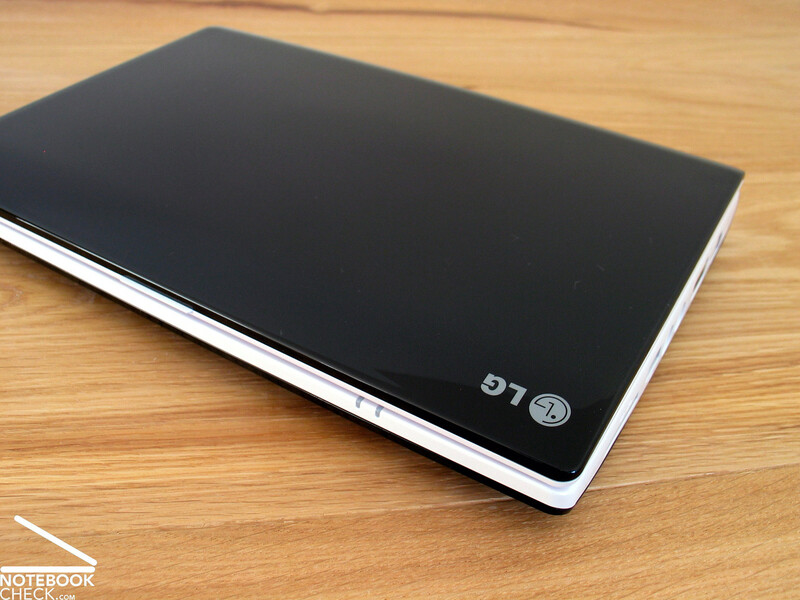 With the X110, LG tries to score primarily with a very attractive design. Unfortunately, we think they went too far with this, seeing that both the display lid as well as the case shell has been provided with a very sensitive high gloss finish. The X110 is interesting because of its low starting price of a bit over 300.00 Euros. In this condition you have to do without a Bluetooth and an integrated UMTS/HSDPA module. The keyboard turned out very positive in the test. 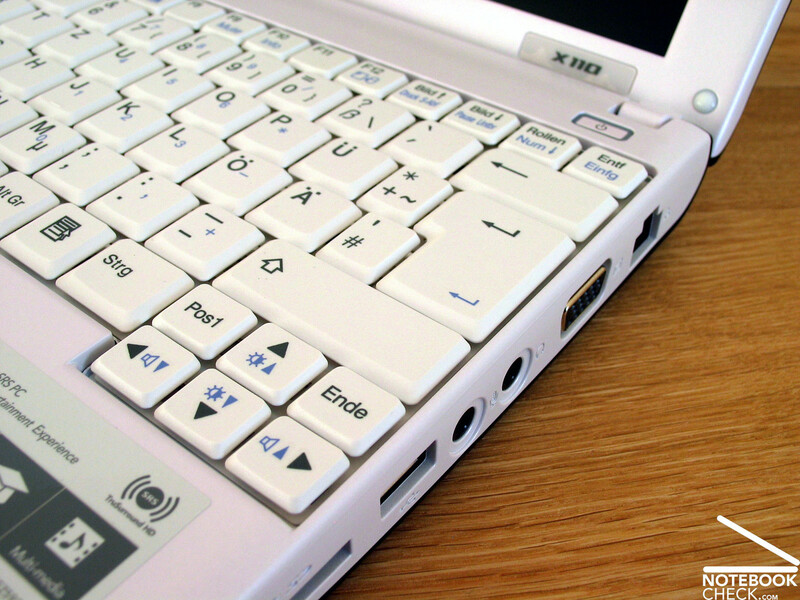 The key size, as well as the layout and typing feeling speak for an even more intensive use of the keyboard. The only deficiency of the input devices, as we see it, is the end to end touchpad key with a bit high of resistance and the dead zone in its middle area. On the one hand the display collects points, in regards to the maximal brightness and the extremely good contrast, but remains with its only under average illumination and an average viewing angle stability not completely without critique. There were no surprises hidden in the built in hardware. 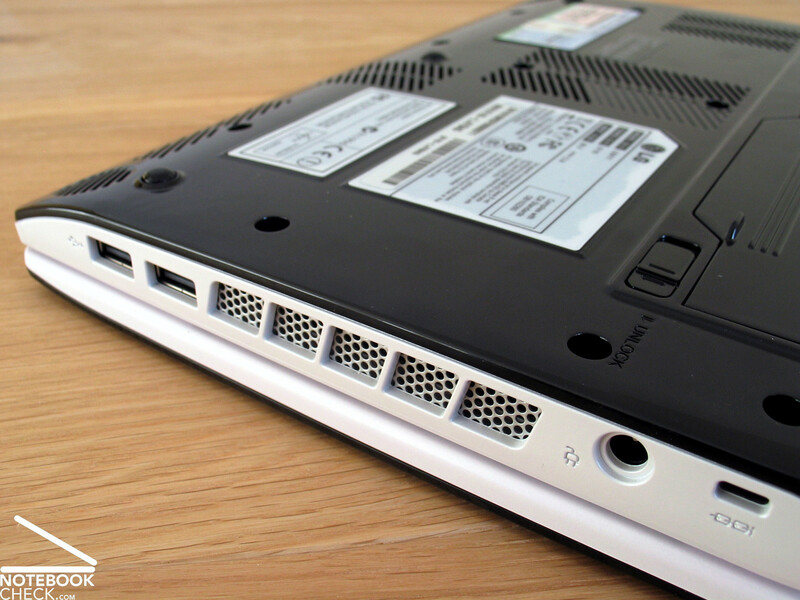 This offers the expected netbook performance for uncomplicated office applications. An extremely quiet use of the netbook is possible with an aligned energy management and the surface temperatures always stay within a limit. The offered speakers have to almost be called indisputable. Music pleasure is practically impossible with them. The 3-cell battery, which gives the X110 merely a moderate battery runtime, cuts off only slightly better. 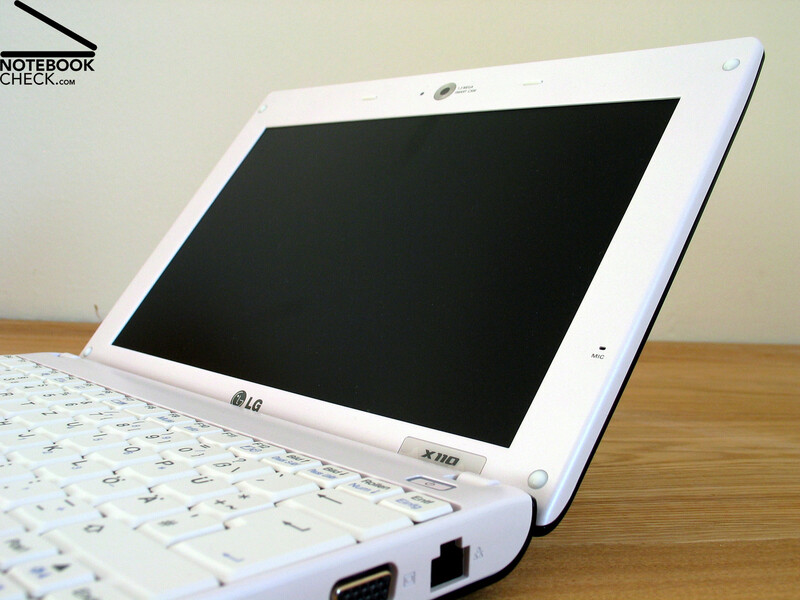 The LG X110 can be described as an interesting device, depending on what you expect from your netbook. Its strengths lie primarily in its design, its input devices and the outdoor suitable display. For an extended mobility, an upgrade of the battery should be considered at any rate. At its expense, the starting price could be pushed down to of only just over 300.00 Euros, making the LG X110 to a serious competitor for established netbooks. Many thanks to Cyberport.de which kindly provided us with the test device. You can configure and purchase it here, as well.. You can configure and purchase it here, as well. 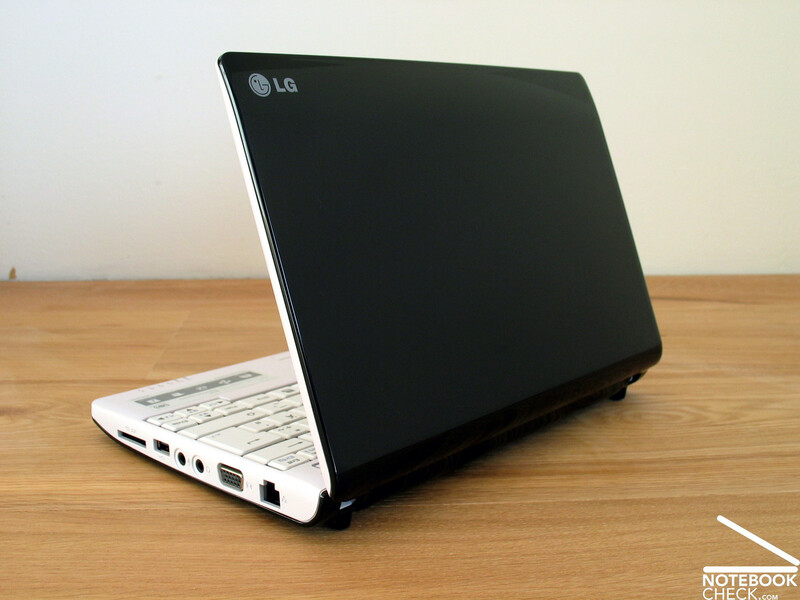 The LG x110 netbook sets primarily on an impressive entrée. The speakers don't give reason for joy. They sound very thin and tinny. 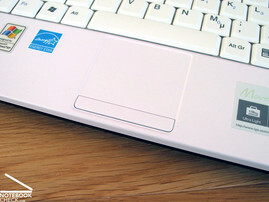 The surface temperatures of the mini-notebook also stay within a limit. 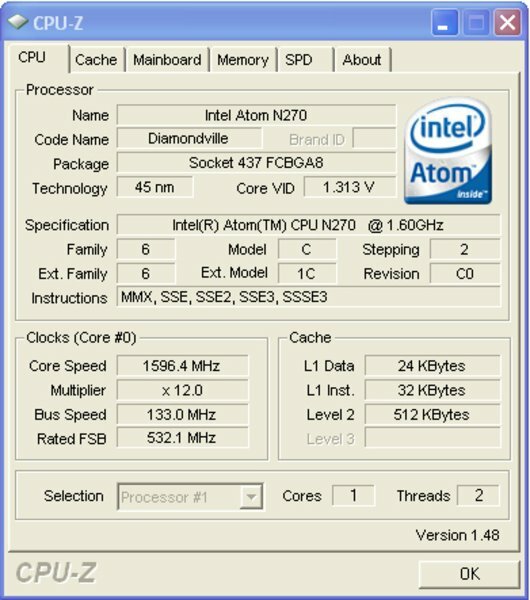 The fan doesn't have all too many problems with the built in Intel hardware (Atom N270, GMA 950). Thanks to the matt surface, the netbook can be used outdoors without any problems. On the other side, the display offers a very good brightness, as well as a good image contrast. Unfortunately, the end to end key belonging to the touchpad has to be critisized, having a large dead zone. 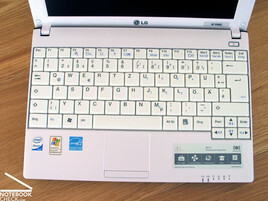 The keyboard could score due to its size, as well as, because of its pleasant typing feeling, in the test. a built in UMTS/HSPDA modem is only offered in a higher quality and respectively more expensive variation. A total of 3 USB 2.0 ports, a VGA-out, as well as audio ports for a microphone and headphone count to this. 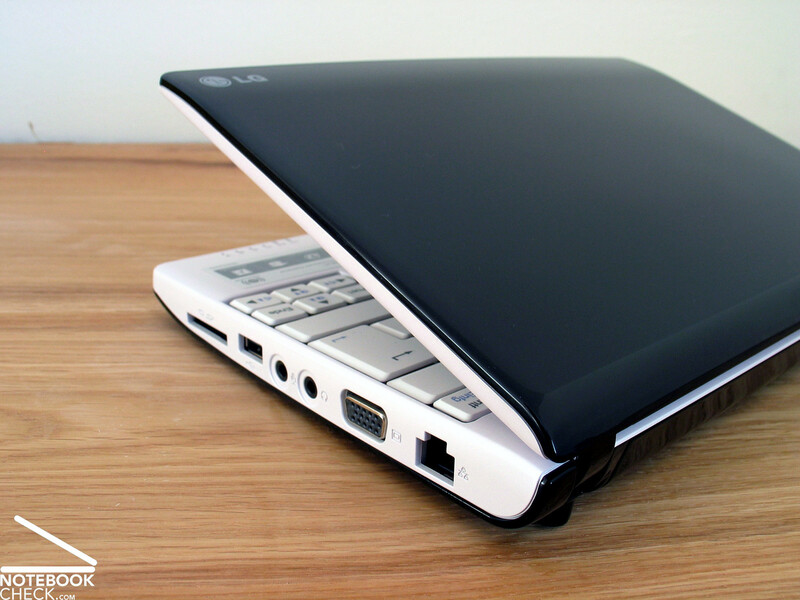 The LG X110 offers the usual netbook basic ports as connections. They grant an opening angle of approx. 133°, can't prevent a luffing of the display though. The very delicately molded display hinges can be considered a bit of a problem in this regard. Due to the applied magnesium alloy the case stability is absolutely alright. The display lid in black piano laquer, as well as a high gloss case jacket provide for an appropriate optic. The 3-cell battery built in ex-factory gives the X110 a runtime of only approx. 2 hours. The sandwich design. Unfortunately, due to the high gloss surface not really practical. Definitely a higher performance battery and that in the basic configuration. The obligatory microfiber cloth or even better: a wholesale package of cleaning cloths. 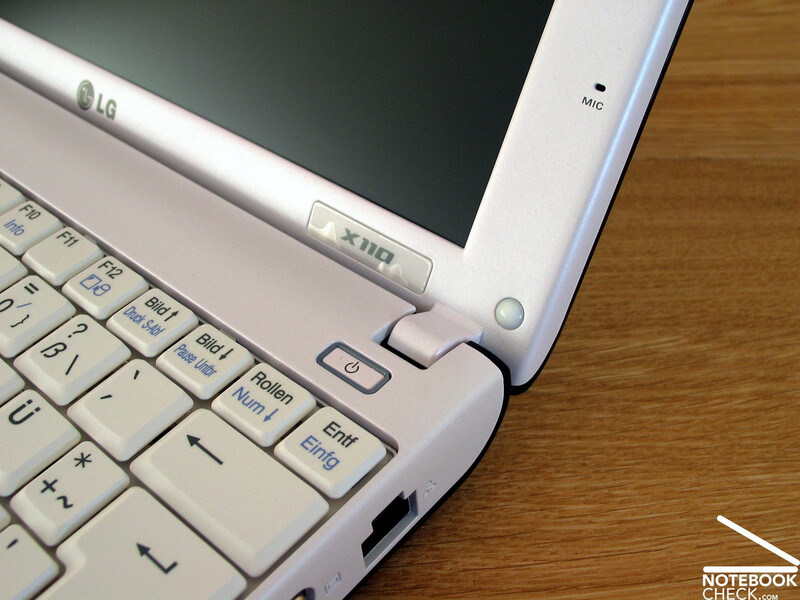 That the mini-hinges are really supposed to hold the display tight for a whole netbook life.